Seasonal Temps or Permanent Staff? Staffing a tasting room is always a challenge, as is getting the right balance of full-time, part-time and temporary staff members. There are many pros and cons for each of these tasting room staffing options, but chances are you will have a mix of staff at any given time based on your company’s goals, visitor traffic and policies. If you were not at the Unified Wine & Grape Symposium in Sacramento, Calif., last week, you missed the largest number of attendees and exhibitors the show has ever seen. This is a great indication of the health of the North American wine industry. Many seminars were geared toward the marketing and sales of wine produced in North America—a direct link to what you do at your winery. It’s not too early to start planning to attend in January 2015. Read about some of the information presented at Unified 2014 here, here and here. Tasting Room in Anderson Valley - $3,500 For a viewing by appointment, please contact Scott Eddinger at 707-738-8774 or by email to scott@ledson.com. January stock up sale! Don't miss out! The most versatile universal red & white wine tasting room glasses on sale! Super break resistant - 100% lead free - made in Austria. Each one of our team members—whether permanent or temporary—represents our brand, our policies and our service standards. We want these to be presented by different staff members the same way, with the same vision or “voice.” Our guests aren’t going to know—and frankly shouldn’t know—which type of staff member they are interacting with. We know that the livelihood of any winery is rooted in the service provided by its employees. Our guests expect much from us, and only the best-hired, best-trained and best customer service personnel can deliver it—even if they are only temporary personnel. Guests expect value beyond price and product. Once a winery establishes what that value looks like, this vision must be engrained throughout all employment levels. Leadership drives culture, and it’s a culture of owning the customer experience, coupled with appropriate communication and ongoing training and coaching, that can create a successful workforce—seasonal or permanent. So how do we ensure that our diverse staff has one voice? Training. Every time a seasonal or temporary team member starts a new work assignment—no matter how skilled or unskilled—a certain amount of training is required in order for them to perform their assigned tasks to suit the specific needs of the winery. Training should not just focus on the operational elements of their job function (such as stocking wine and managing the register), it should ensure that seasonal employees understand and embody the brand’s commitment to their guests’ experience. Providing training that encompasses skills that build rapport and trust with our guests—skills that differentiate our brand and skills that help them sell professionally and naturally—are all ways to prepare staff to own the customer experience. Training is essential for all staff, whether it’s a refresher or new material for new staff. Create mini-trainings for staff on your wines, winery and procedures. Send team members to be WISE-certified (shameless plug!) or have onsite training. Manuals. An operations and training manual is a good way to ensure job responsibilities and communication across full-time, part-time and temporary staff: When everybody knows who is doing what job, there are fewer opportunities for miscommunication, conflict and poor service/sales. Then, a manager can quickly identify and improve areas of weakness, stepping in at the moment and then staffing and training for the future. Choreographing. Create “staging” of the guest experience by coaching staff on which key brand points to cover at specific locations during the tour or at specific intervals during the tasting. This choreographing ensures every guest is afforded the same level of service, education and experience. Briefings. Use opening and/or closing of the tasting room to gather the staff for the day and do a 10-minute briefing about any winery updates, key points to cover with guests or other “housekeeping” items that help keep the team cohesive. Always monitor your staff and catch them in the act! Praise them when they are doing a good job. Come up with solutions or alternatives for those who have challenges. If our staff is the mirror of our brand, what is our reflection saying? A new tasting room opened last year in the middle of downtown Healdsburg. The name ParTake was new to me, but after a closer look I realized it was related to Kendall-Jackson. Jessica Record was my lead server, and her hospitality made the experience even more enjoyable. 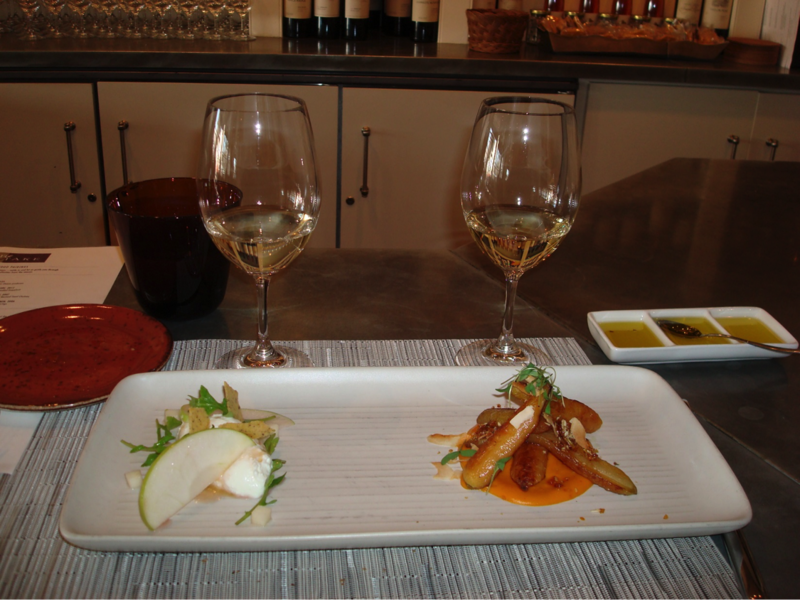 ParTake offers high-end food and wine pairing in Northern Sonoma County, and most visitors make it lunch and/or dinner. The interior is very bright, modern, sparkling and hosted by friendly and mostly knowledgeable millennial personnel. The menu offers at least three tasting options as well as a la carte ordering. I chose the mid-priced option and was skeptical about the size of the servings and the type of foods being offered. I needn’t have been worried, however. The quantity of food was enough for an entire lunch, and it was well worth the $35 price tag. Some of the dishes were served warm, which made a huge difference and best reflected the pairing you may want to duplicate at home. The only challenge I found was the timing between the wines being poured and the serving of the food, which sometimes required me to ask for a second tasting when my glass was empty. Overall it was a great experience worth being duplicated by other wineries. The second annual WiVi Central Coast Wine & Viticulture Symposium/Tradeshow is incorporating a direct-to-consumer track when sessions begin March 19 at the Paso Robles Event Center. Learn more and get registration information here. We keep track of how often our web articles are read in order to tailor the news to what is of interest to our readers. In “Top Wine Web Stories of 2013,” Wines & Vines staff writer Andrew Adams takes a look at the top 20 stories of 2013, and the diversity of subjects is a great indication of the diversity of our readership. Wine Spectator, a consumer-oriented magazine, also published its top 10 stories of 2013, and the subjects are very different, reaching the readers more interested in social news than wine and grape production. Read “Top Wine Stories of 2013” here. Keeping your Chardonnay or Riesling cool while outdoors can be a sloppy venture. The labels start floating in the melting ice bucket and usually slip off as you are serving the wine. Although I have not tested this type of label, Smart Planet Technologies Inc. has developed a label with a protective moisture barrier designed for wet conditions. Read more here.